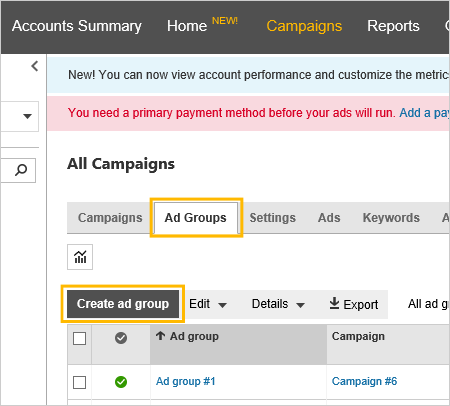 Learn about ad groups and how to create ad groups to organize your campaigns by specific products or services that you offer. Ad groups are the best way to organize your campaigns by specific products or services that you offer. 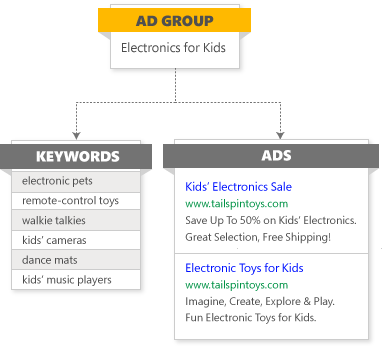 An ad group contains a set of keywords and ads that are related to a common theme. Not only do they make it easier to manage related ads and keywords, well-organized ad groups make your ads more relevant to users’ searches. This, in turn, can help improve your ROI. For example, Sarah owns a toy store and wants to create ads to highlight specials she will be offering. She could create different ad groups for “electronics for kids” and “riding toys,” which will each contain different sets of keywords and ads. 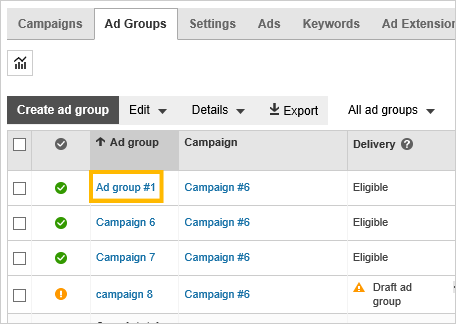 When she wants to make adjustments to these ads, she can easily make changes to all the ads in a given ad group simultaneously. 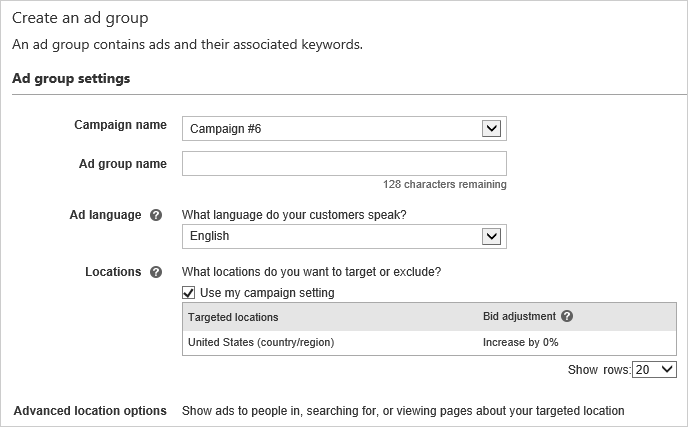 On the Campaigns page, click the Ad groups tab and click Create ad group. 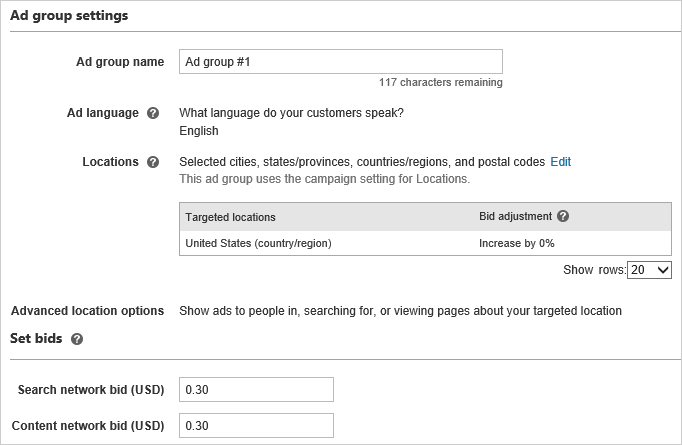 Enter Ad group settings, including ad group name (up to 256 characters), language, and location. Enter information to create your ad. You can always create more ads later. 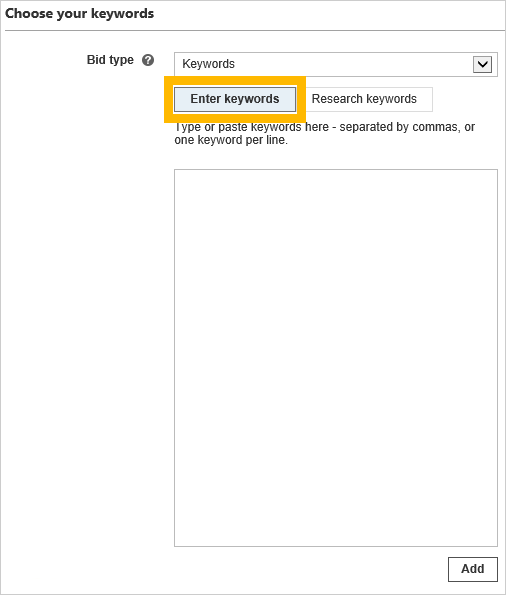 Select your bid type, keywords or placements, and enter your keywords here. You can also get keyword suggestions by clicking Research keywords and entering an initial keyword. Once you add keywords to an ad group, you can't move them to another ad group. Ad group names, ad titles and text, and keywords cannot contain scripts, HTML, or other markup language. 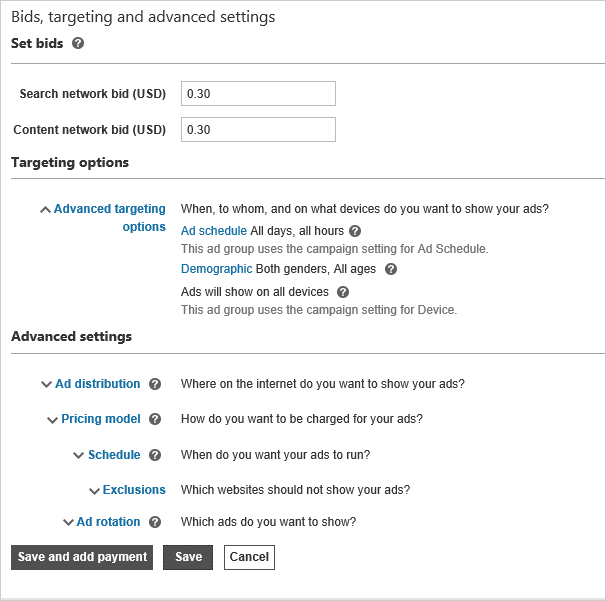 After clicking save, set your bids, targeting, and additional advanced settings. Click Save and add payment to enter your payment information or Save to complete your ad group creation. 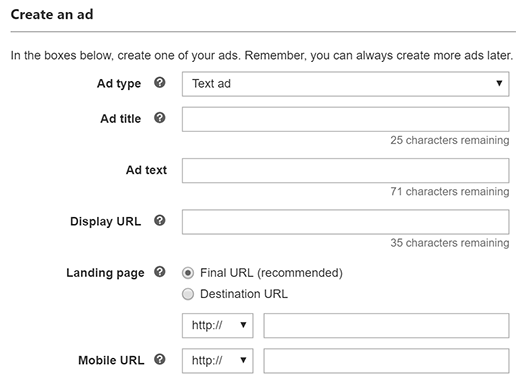 On the Campaigns page, click the Ad groups tab and select the ad group you want to edit. You can also select one or more ad groups and click Edit selected row to bulk edit. For the Ad group and Bid columns, you can hover over the value of the summary table and click on the small pen icon to edit the value right from there. Click the Settings tab to make necessary changes.